Home / 2011 / December / Silicon Valley "40 Under 40"
Astrophysicist Enrico Ramirez-Ruiz is among 40 "rising stars" in Silicon Valley recognized by the Silicon Valley/San Jose Business Journal. A special "40 Under 40" feature in the December 2 issue of the Business Journal includes profiles of the honorees, who are recognized for their accomplishments and the impact they have on their communities. Since joining the UCSC faculty in 2008, Ramirez-Ruiz has won a prestigious Packard Fellowship for Science and Engineering and a National Science Foundation CAREER Award. In 2009, he established the John Bahcall Award, which supports an outstanding undergraduate physics student from Mexico for an eight-week research internship at UC Santa Cruz. In 2010, he was elected a corresponding member of the Mexican Academy of Sciences. Then 35, he was the youngest scientist ever elected to the academy. 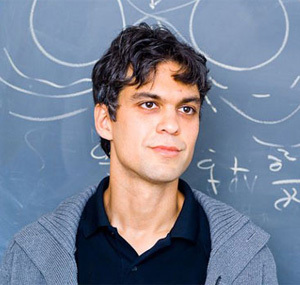 A theoretical astrophysicist, Ramirez-Ruiz uses computer simulations to explore violent phenomena such as stellar explosions, gamma-ray bursts, and the accretion of material onto black holes and neutron stars. His research addresses fundamental questions in high-energy astrophysics and provides a framework for understanding the observational data coming from new telescopes and astronomical surveys. The "40 Under 40" honorees were celebrated at a reception in Santa Clara on Thursday, December 1.